Product information "Bluing solution "Black Devil""
The so-called "cold bluing" or blackening means applying an anti-corrosion layer using an immersion bath. The bluing protects at the same time from rust formation – an effect comparable to zinc coatings. A chemical reaction on the surface of the metal transforms the latter of the blackened object. This process creates a thin layer which doesn't change measurements of threads and precison components. The cold bluing kit "Tifoo Black Devil" allows you to do yourself easy bluing of ferruginous surfaces (unalloyed steel, iron, castings) and to save time and money. The bluing concentrate can be used in pure state on steel with a chromium content of 3 to 12 %, diluted at a proportion of 1:2 on steel with a chromium content of under 3 % and diluted at a proportion of 1:3 for little alloyed and construction steel. The bluing with our product or our kit is not only nice to look at, but protects also the material. 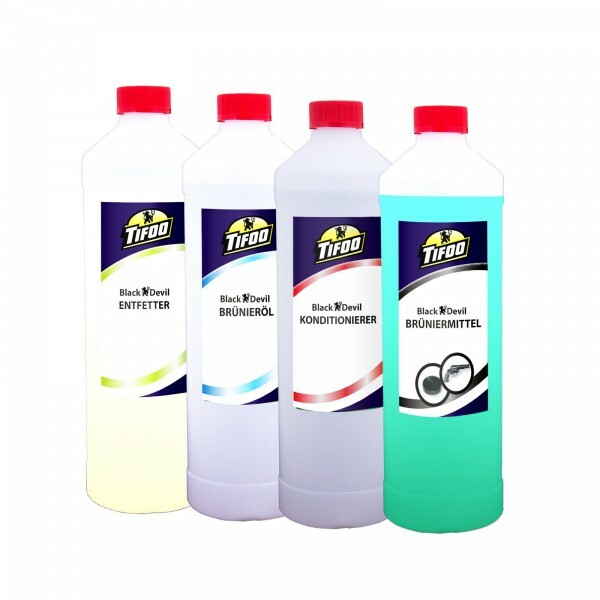 The Tifoo bluing allows you to blacken entire components or small replacement parts and to restore already existing bluings. It is suitable for screws, small car parts, weapon accessories and workpieces of industry an commerce (see our application video). IMPOERTANT: Tifoo bluing Black Devil can't be used on: chrome, aluminium, titanium, tin, lead, bismuth or highly alloyed steel like e.g. Nirosta, V2A or V4A. All of these products can also be purchased separately. Degreaser: cleans greasy marks form the object. Essential for a good result. Conditioner: activates the surface in order to enable it to absorb the bluing. Bluing concentrate: blackens and protects the surface. Bluing oil: gets absorbed, drives out traces of water and closes the layer caused by the bluing to avoid humidity. This last step ensures the rust protection of the blackened object. 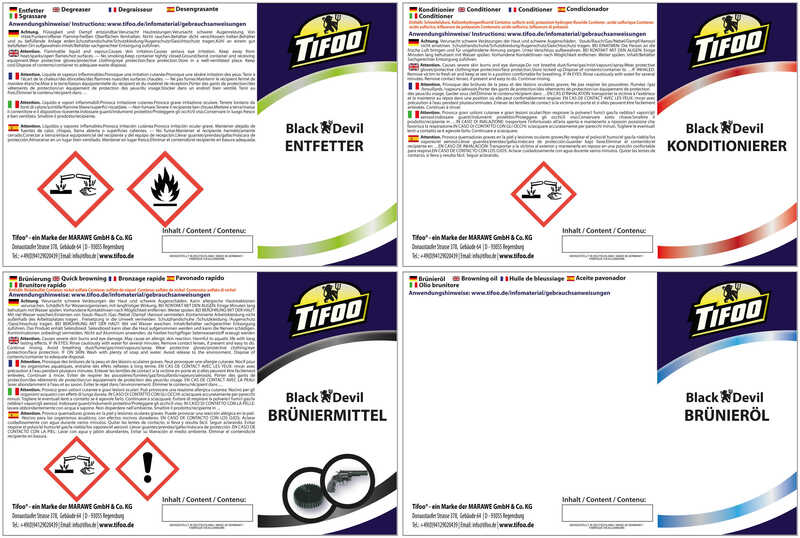 Related links to "Bluing solution "Black Devil""
Instruction manual for Tifoo Bluing solution "Black Devil" as PDF file. Customer evaluation for "Bluing solution "Black Devil""
Dans la mesure ou l'acier est de qualité, E235 le rendu est tout simplement execptionnel. Pour un acier de moins bonne qualité le resultat reste tout de meme plus que correct. reste a savoir la durée dans le temp. Hab mir das Produkt vor 2 Wochem mal zum ausprobieren bestellt (ohne große Erwartungen). Hab damit Konstruktionsbauteile und Maschinenkomponenten schwärzen wollen....und ich muss sagen ich bin begeistert. Dachte immer sowas gibts nur beim Fachbetrieb und man kanns nicht sleber machen. einziges Manko: man sollte gut belüftet arbeiten, da beim brüniermittel doch ein recht starker Geruch entsteht. Ansosnten bin ich aber sehr zufrieden. Gerne wieder.